This recipe calls for two seasonal items, eggnog and dried cranberries. 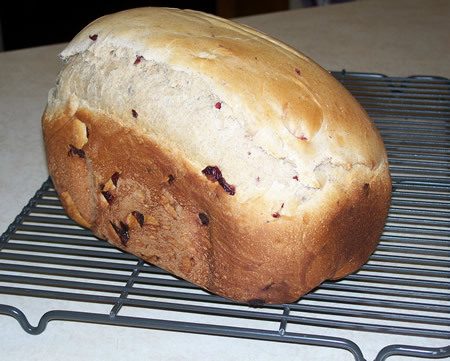 You can substitute raisins for the cranberries if you’d like, but the cranberries give the bread a little zing. Plus they’re really pretty in the finished product. Follow the instructions that came with your bread machine in terms of which ingredients to put in the bread machine first. 11/27/2014 Update: I’ve made this bread with two different machines. On the Zojirushi Virtuoso breadmaker the medium crust is best with this recipe. However I liked the light crust setting when I used my Zojirushi BBCCX20 Bread Machine. Make sure you check on the dough after five or ten minutes of kneading. Pop open the top of the bread machine and see how the dough is doing. It should be a round ball. If it’s too dry add liquid a tablespoon at a time until the dough balls up. If it looks too wet, add flour a tablespoon at a time until it looks as expected. Here’s the loaf as it came out of the bread machine . . .
And here’s how it looked when it was sliced . . .
See how pretty those cranberries are? And how does it taste? It’s really, really good. The bread has a cake-like texture. There’s a slight nutmeg, eggnog flavor. The cranberries give it a little bit of contrast. So far I’ve had it plain and toasted with butter. This weekend I want to try it as French toast. Yum! Note: Don’t despair if it’s summer and you’d like some eggnog bread. 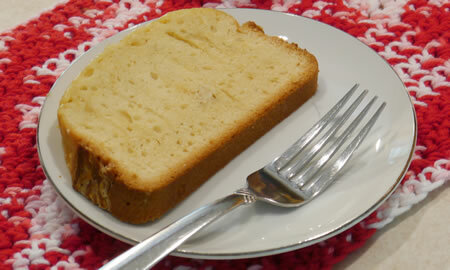 I’ve got a recipe for Anytime Eggnog Bread. It captures the taste of this yummy bread, but without the eggnog. This is amazing! I made it this morning and it did not disappoint. I did slightly warm the eggnog and milk as my bread machine does not produce well if the liquid ingredients are cold. I will definitely make this a few times during the holidays, may even try to add in some wheat flour while I am at it. I’m glad you like it! If you try it with wheat flour let me know how it goes. I’m going to try it as French toast on Sunday. Sounds delish! Did you add all purpose flour or bread flour? And i have an older bread machine not sure which order to add the ingredients but this looks about right. Curious on the flour though…. Tiffany, It’s really, really good. I hope you like it. And thanks for the question about the flour. I used bread flour. I’ve updated the recipe because I’m sure you’re not the only one to wonder about that. can’t wait to try it. going to make it tomorrow!! made the bread tonight. it was perfectly delicious!! thanks for posting the receipe. I do not live near a store that keeps a supply of ‘bread flour’ on hand. When I’m in a ‘bread mood’, I can’t easily get ‘bread flour’. Would it be possible for me to use plain flour in this recipe? Would there be any adjustment I would have to make to the present recipe by using plain flour? Dora, I haven’t tried the recipe with regular flour, but you might give it a try and see how it works. Bread flour has more gluten than all purpose flour. 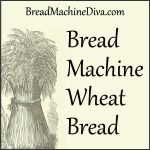 (Learn more about bread flour on this page.) However the amount of gluten in flour varies and it could be that your brand of flour will do fine with this recipe. The added gluten helps the bread to rise, so it it doesn’t work the bread won’t be as high as it would normally. I bet it would still taste fine though. Some people make their own bread flour. For every one cup of flour replace one tablespoon of flour with one tablespoon of wheat gluten. In other words, for every cup of flour take out one tablespoon of flour and substitute one tablespoon of gluten. There is a gluten flour that you can keep on hand when you don’t have or use bread flour. It comes in a small bag, and you want to add a couple of tablespoons to a recipe to increase the gluten content. It seems expensive, roughly $6 for a small bag, but it will last a long time. Keep it in the refrigerator. Made this bread using 2 cups bread flour, 1 1/2 whole wheat flour and 1/2 cup oats. Fabulous and much healthier. Wendy, Thanks so much for sharing. That sounds healthy AND tasty! Home made eggnog? Yum!! I’d give it a try with your home made. I’ve noticed that the bread has a slightly different taste and consistency depending on what brand of eggnog I buy. They’re all good, but I like some better than others. There’s no way to know until you try though. This was delicious! I made one with some leftover eggnog, and immediately made a second loaf for an elderly neighbor. So glad I found it. I’m so glad you liked it. I had some for breakfast over the weekend. I rally like it too! I have never thought about combining these two ingredients. I LOVE eggnog and I love bread but never thought about eggnog bread. 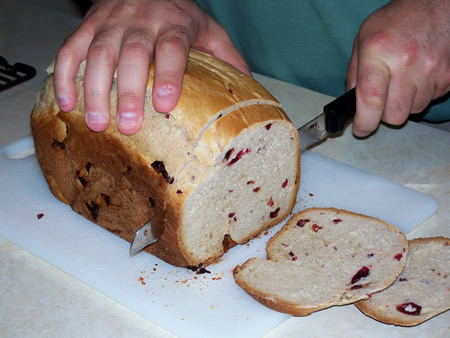 I dont have a bread maker but I might order one just to try this concoction out! Michelle, if you do come up with a non bread machine recipe please share. I know that other people will want to know. How would you 1/2 this recipe? Hi Sarah, Do you mean how would you make a one-pound loaf? I don’t have a recipe for that. All, Has anyone else tried? If so, please leave a comment. We’d be interested to hear. I did. I simply divided all the ingredients in half. But mine did not rise like yours did. Good, but kinda heavy. Does the type of machine make a difference? I have an older machine with a vertical pan with 1 paddle, not the horizontal 2 paddle machine that you have. I think I need to add more yeast or less salt to get more rise. Just confirming that you are using ActiveDryYeast, not instant/bread machine yeast. Hi Gary, It would seem like dividing a recipe in half would work for turning a two-pound loaf recipe into a one-pound loaf recipe. In my experience it’s just not that easy. If you ever get a final version of your recipe done, I’d love to see it. 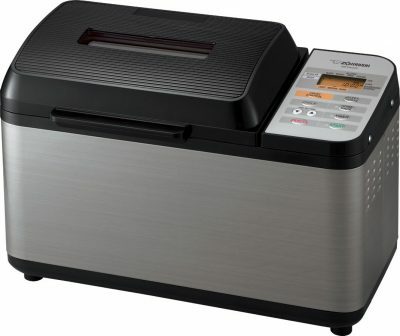 Unless specifically stated otherwise all the recipes in this site use bread machine or instant yeast. Now that I know I used the wrong yeast, I am going to do another loaf tomorrow, while I still have egg nog in the fridge. Fingers crossed. The flavor was GOOD, so I think halving the recipe works. It was just that my bread did not rise much. Out of egg nog, and none in the stores. I guess I have to wait till Dec to try it again. Hi Bonnie, I would not use the eggnog with the alcohol in it. 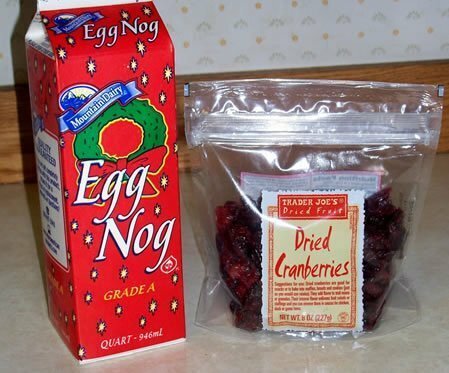 If you don’t have the dried cranberries, I’d use raisins instead. Long story short :: after years of having my bread maker in the garage I told hubby to find it for me cause I wanted to give it another go. Glad I did but now I need recipes. 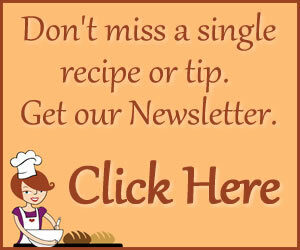 Found your site yesterday and first one I saw was the Egg Nog recipe. My boys LOVE Egg Nog. Going to give this a whirl today. Wondering something though. Since they love the flavor of egg nog so much can I put ALL egg nog instead of egg nog/milk mix? 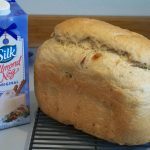 Does the 1/2 C milk make a difference in texture or how the bread turns out? Really want a strong egg nog flavor. Hi Diana, Thanks for writing and I’m so glad you found this site! What I’ve discovered is that the eggnog flavor depends a lot on the eggnog that you use. I’d start with the recipe as stated and then adjust on your second loaf. Oh one more quick question that I just thought of while getting out ingredients. Do I add the cranberries after the beep or ok to add at beginning? Since they are dried I assume all at once but since I am also so new to bread machine bread making I don’t want to goof it all up lol. Hi Diana, I’m making a loaf of this myself right now. 🙂 I’m making this batch with raisins and I put them in at the very beginning. The instructions with the Zo say that dried fruit should go in at the add beep, but I haven’t had good luck with that. I’m also going to try it with the medium setting this time. The last loaf I made using the light crust setting looked like it could have cooked for a few more minutes. This is a newer model of Zo and I’m wondering if that was the reason. I made this with organic whole wheat flour (just a bit less than the recipe calls for) and it is fantastic! Dena, thanks for letting everyone know about this healthy alternative! Hi Rachel, You should use the regular/basic setting. I made this to donate to our food bank. Finally found some Silk Soy Eggnog and gave this a go this past weekend. I think I erred on the side of stupidity as I added a bit of Vital Gluten (doubt it needs it frankly!) and the loaf came out a bit poofy on one side. 🙁 BUT that was my error and won’t do it again. However, as for the recipe and the bread itself: FABULOUS DAHLING! The craisens added just the punch for this bread as the Soy ‘nog is not as heavy or as heady as regular eggnog would be. I put in a pinch of nutmeg as well as the cinnamon. I used some of KAF’s dried Baker’s milk and a bit of filtered water for the “milk”. 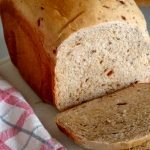 This is certainly a do-again as often as possible bread recipe! Thanks, Marsha! Yay!! It sounds great and I’ve got to give it a try.